The End Is Nigh!!! ‘World War Z’ To Be Unleashed World-Wide On December 21st, 2012!!! The End Is Nigh!!! 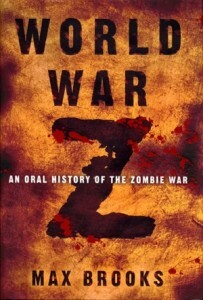 Paramount Pictures has just released that the zombie epic ‘World War Z’ film will be released December 21st, 2012. That is very fitting. Isn’t that supposed to be the start of the end of the world according to the Mayan calendar? I love this story. Max Brooks (son of Mel Brooks) wrote the book which is an oral history account of the Zombie Apocalypse. Brad Pitt will star in the film. “Warner Bros opens the Peter Jackson-directed The Hobbit: An Unexpected Journey December 14, Relativity Media’sHunter Killer, Fox’s Life of Pi and Disney’s Lone Ranger open December 18, and The Weinstein Company open the Quentin Tarantino-directed Django Unchainedfor Christmas.” So this ‘World War Z’ has quite the bit of competition. 2012 Holiday season will be AWESOME for movies!!! Suzanne Takes A Look at Zombies in ‘World War Z’!!! Check Out Some Behind the Scenes Images From The Upcoming Zombie Film, ‘World War Z’!!! This entry was posted on Tuesday, August 9th, 2011 at 5:30 pm	and is filed under Film, News. You can follow any responses to this entry through the RSS 2.0 feed. You can skip to the end and leave a response. Pinging is currently not allowed. « Texas Theatre’s Tuesday Night Trash Presents ‘Fade To Black’!! !